Unlike cleaning your bathroom or doing a load of laundry, adding your protein powder to your diet doesn’t have to be a chore. Whether you want to take protein powder to manage your weight or gain lean muscle, there are tons of tasty, easy recipes you can use to get excited about your powder! It only takes a few basic ingredients, like fruit, milk, seeds, or cocoa to create the smoothie or shake of your dreams. We’ve put together a list of our favorite ones to help you get started. 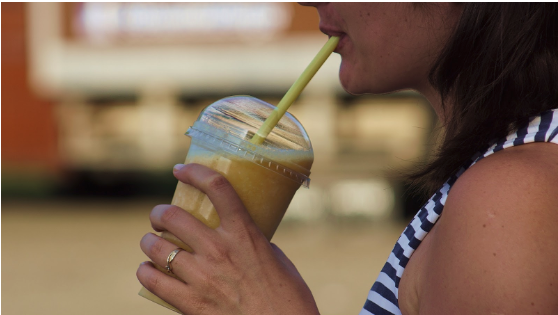 But before we get into it, let’s tackle the ultimate debate: smoothie or shake? Though these two words are often used interchangeably, their bases are completely different. A smoothie has a fruit-base, and does not contain any milk or yogurt, making it an ideal choice for those who follow a vegan or dairy-free diet. A shake, while similar to a smoothie in texture, generally contains dairy, whether in the form of milk, yogurt or ice cream. In addition to thickening the beverage, dairy also adds a little calcium, vitamins and protein to the mix. With this in mind, we tried as many shakes and smoothies as we could. Here are 35 of our favorites for you to try test out for yourself. Why we love it: Anything with chocolate, banana and peanut butter is pretty much guaranteed to be delicious, but we loved the addition of the plain greek yogurt to give it that extra thickness. If you’re vegan and looking to try this recipe, you can always substitute the greek yogurt for a coconut-based one! Why we love it: Peanut butter? Check. Protein? Check. Açai? Double check. This naturally dairy-free recipe was our go-to for protein/açai combination. Plus, we loved the bright color the açai gave it. Why we love it: This vegan Blueberry Muffin Smoothie is hands down our favorite With dates for sweetness and spinach for a superfood boost, this smoothie is chock-full of nutrients to get you going, without having to sacrifice that early morning pastry craving. Why we love it: Why go for chocolate chip when you can go for double chocolate chip instead? We love that this rich protein shake has both chocolate protein powder and dark cocoa powder, and also that it can be made with a variety of liquid sources, depending on your diet and preference. 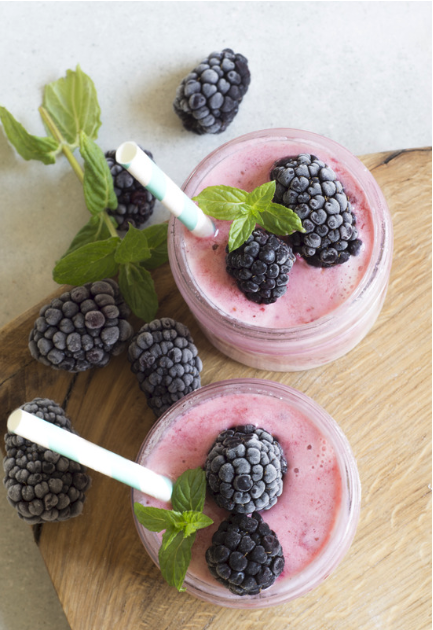 Why we love it: This berry-centric smoothie relies on the fruit for the main flavor profile, and the protein powder acts as an additional subtle support. It’s simple and healthy, and gets the job done without feeling like a heavy dessert. Why we love it: This one is for all the Almond Joy and Mounds fans out there. With just four vegan ingredients, it’s like eating your favorite candy while still adding protein to your diet. Why we love it: This smoothie is like the creamsicle of our dreams, thanks to the peach. The orange creamsicle flavor is still prominent, but we love how the peach compliments it. Why we love it: Consider this vegan smoothie your personal island vacation. It’ll transport you to tropical bliss in the dead of winter, and the added spinach can help to keep you full. Why we love it: Think of that moment when you’re in line at the grocery store, quickly approaching the wall of last-minute purchases, and you see the chocolate bars calling to you. Now there’s a healthy option to opt for instead, without compromising on sweetness. Vegans and dairy free dieters should avoid this one though, since it relies on a greek yogurt base. Why we love it: This chocolate protein shake sets itself apart with the addition of flaxseeds, which are full of additional beneficial nutrients. Using an unflavored protein powder base allows you to to adjust how chocolate-y you want your shake to be, too. Why we love it: Honestly, what can’t butternut squash do? For ravioli, as a pizza topping, or in this case, a vegan protein shake base, butternut squash is a delicious and unique addition that works perfectly here with cinnamon and nutmeg. Why we love this one: Adding oats into this recipe makes it a thicker, heavier shake that keeps you feeling full longer. Though the original recipe does call for a specific cinnamon flavor of protein powder, don’t worry if you have a different kind: feel free to substitute with an unflavored protein powder and add cinnamon to taste (which is what we did!). Why we love it: This is another one to file under sweet-tooth fix, for anyone who ate their Peppermint Patties first on Halloween. This non-dairy shake is a great substitute. Why we love it: The cinnamon in this vegan recipe is what really separates this one from some other chocolate, banana and peanut butter combinations, giving it a delicious twist. 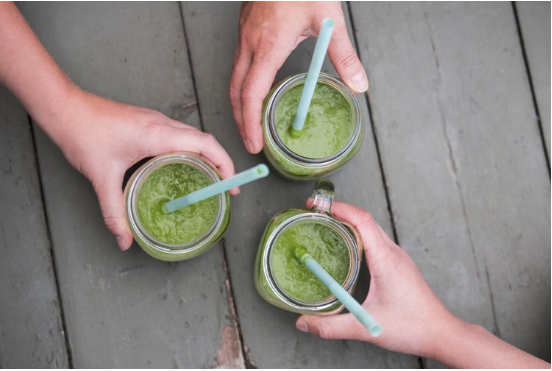 Why we love it: If you’re someone who has at least three beverages on their desk at a time (coffee and water, and then a shake/smoothie/juice on the side) this one helps you narrow it down! We love the caffeine boost we get with this one, so we’re able to get our caffeine and protein at the same time. Why we love it: Get your PB&J fix without having to open a lunchbox! This non-dairy one gives you the option to use any frozen berry of your choosing, so you can pick exactly what “jelly” you want to channel in this shake. Why we love it: While the creator recommends it “as meal replacement on a busy morning, or as a post workout snack” we see it as a true dessert replacement. We preferred the spinach to the food coloring for an extra health boost! Why we love it: Usually reserved for juices, ginger is the true star of this shake, and tastes delicious with the banana and molasses. Why we love it: The addition of the espresso here acts as it would in adding to frosting, and creates a richer, more complex chocolate flavor, not to mention a caffeine boost! Why we love it: Is there anything more classic than a strawberry banana smoothie? This one gets a slight upgrade with the added flaxseeds, helping to reinvent a staple. Why we love it: This one comes from the traditional strawberry banana base, but gets its cheesecake-like taste from the delicious tangy greek yogurt. Why we love it: These five easy ingredients will have you feeling like Summer came early this year. Simple and healthy, this one is a quick, delicious shake to make. Why we love it: The addition of the oats in this shake make it a go-to for a filling post-workout drink, and we love that it can be made vegan by adding non-dairy milk! Why we love it: Another variation on the theme of creamsicle, this one sticks to two essential flavors: orange and vanilla. A go-to for anyone who loves that classic taste. Why we love it: This is a fantastic base for anyone who wants to experiment with different flavors. We used spinach, mango and banana for our greens and frozen fruit combo. Why we love it: This smoothie covers all the bases: chocolate, vegetable and fruit all in one, and, like the recipe before it, gives you the freedom to choose your flavor through the choice of berry. Why we love it: There’s nothing quite like a milkshake! It doesn’t have ice cream but , it was full of vanilla flavor, thanks to delicious vanilla bean paste. Why we love it: Avocado and blueberries may seem like a strange combo, but they come together perfectly in this vegan shake. Even though the recipe calls for wild blueberries, we know it can be hard to get those, so don’t let that discourage you: it tastes just as good with regular ones. Why we love it: This recipe had us at nutritional yeast and turmeric. It’s a delicious and unique spin on the peanut butter cup flavor. Why we love it: The combination of the kale and hemp seeds sets this peanut butter shake apart, as both balance out the heavy peanut flavor. This is an excellent shake to take after workout. Why we love it: Since banana is often thrown into many shakes as an addition, it’s great to see one that focuses on the banana as the primary flavor. The additions of cinnamon, greek yogurt and vanilla powder make for a delicious morning shake. Why we love it: Soy milk isn’t too prominent in many of these recipes, but works perfectly with the slivered almonds and sugar free maple syrup, to make a slightly lighter shake. Why we love it: The cooked oatmeal lends itself perfectly to the mashed banana and bran flakes, making this shake a healthy and delicious option for those looking to gain lean muscle while on a vegan diet. Why we love it: Flavor aside, we love the flaxseed oil, which is full of omega-3 fatty acids, added into this classic flavor combination. Whether you’re craving a pie, morning pastry, cup of coffee or just want a healthy and filling shake, any of these recipes can help you to achieve your protein powder goals. And the best part is that any of these recipes can be modified to make any combination of flavors that you want. Happy blending!